The wreck of a 17th-century Dutch warship has been discovered off the coast of Tobago. Marine archaeologists believe the vessel is possibly the Huis de Kreuningen, which was lost during a bloody fight between Dutch and French colonists. On March 3, 1677, the French Navy launched a fierce attack against the Dutch in Tobago’s Rockley Bay. European settlers coveted Tobago for its strategic location; in fact, the island changed hands more than 30 times after Christopher Columbus arrived in the New World. The abbreviated story of this particular battle is, “Everybody dies, and every ship sinks,” according to Kroum Batchvarov, an assistant professor of maritime archaeology at the University of Connecticut. Indeed, about 2,000 people were killed and up to 14 ships went down during the skirmish. But until now, none of those sunken vessels had been recovered. “Quite literally, the first thing we saw at the bottom was a cannon,” Batchvarov told a small audience here at the Explorers Club headquarters today (Nov. 3). During that initial, 20-minute dive, the researchers found at least seven cast-iron cannons, some of them large, 18-pounder guns. [. . .] Because of the size of the cannons found at the site, the archaeologists suspect the wreck could be the 130-foot-long (40 meters), 56-gun warship Huis de Kreuningen. Only one other Dutch vessel, the flagship Bescherming, could have supported such large guns, but it survived the battle, Batchvarov said. 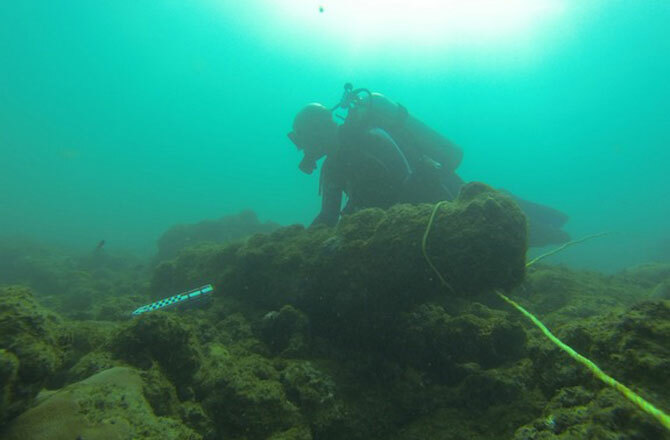 Without proper conservation facilities nearby, the artifacts Batchvarov and his colleagues discovered had to be reburied underwater. But the project has just been awarded a grant from the U.S. State Department’s Ambassadors Fund for Cultural Preservation so that the artifacts can be conserved and displayed in Trinidad and Tobago. Batchvarov and his colleagues plan to return to the site next year; their main goal is to establish the extent of the wreck.